Ink cartridge delivers durable, high-quality text documents and vivid color images. Cartridge design uses proven and proprietary ink technology (pigment-based) for increased durability and reliability. Your documents and marketing materials will stand up to water and resist fading over time. 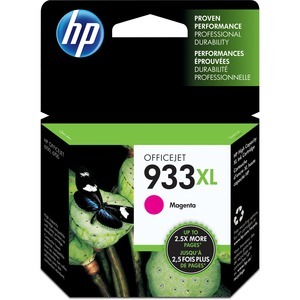 HP 933XL cartridge is designed for use with Hewlett-Packard Officejet 6700 Premium, Officejet 6600 and Officejet 6100 printers. Color cartridge yields approximately 825 pages.